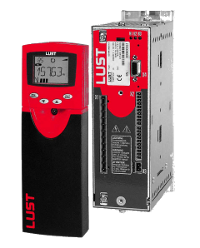 CDx3000 series from LTi includes frequency inverters for speed adjustment of asynchronous motors, servo-inverters for close loop control of asynchronous motor and servo-drives for control of permanent magnet servo motors. CDAs can drive asynchronous motors. Except from normal V/f, CDA performs frequency control every 20-30ms, field(encoder) and current every 2ms. Open loop CDA can adjust speed 1:50 open loop and 1:10000 close loop. CDA is used more often without feedback. The main advantage against competition is the high torque at low speed. CDA has a number of programmable I/O. Additionally program scripts can be run in internal PLC. So small scale problems can be solved without additional hardware. RS232 is standard. Fieldbus cards are offered separately. Sizes from 0,75kW until 132kW. With the same characteristics from CDA and additional positioning capability CDB is an ideal solution for a large number of servo applications. With the use of an incremental encoder asynchronous motors can spin with 100% of their nominal torque at 0 rpm. CDB can handle TTL and HTL encoder as standard. The number of increments affects the positioning accuracy. Just like servo drives CDB has torque, speed and positioning mode. Having bigger inner inertia from permanent magnet synchronous motor, asynchronous motors with CDB can accelerate 0-1400 in ~30ms without load. Control is 4 quadrants which means that they can also decelerate in ~30ms without load. CDB servo-inverters is an intermediate solution between frequency inverters and servo drives. Price difference between motors is very big. Sizes from 0,375kW to 110kW. Servo-drive CDE can drive permanent magnet servo motors. Low inetria and high dynamic are the main characteristics of permanent magnet motors. They are used in high dynamic applications. A typical application of 12 start/stops with load and an acceleration-deceleration 0-3000-0 of 16ms shows the potential of those motors. ServoOne is the LTi latest drive. The new CPU offers more power for better motor control and faster Fieldbus systems. Parametrization is done by PC via USB or ETHERNET cable. Lti offers CoDeSys runtime as an option. ServoOne can drive asynchronous, synchronous, linear and torque motors. Junior series lite version with limited performance. LT-i drives are build and tested in Germany.